Description: Eastbound intermodal enters the Colorado River crossing choke point. Description: WARNING! I WASN'T HERE TWO MINUTES AND THE SHERIFF DROVE BY. Description: LOTSA POWER TO GET THIS EASTBOUND STACKER GOING ONCE THE STACKER UP AHEAD IN THE NEXT BLOCK GETS ROLLING. 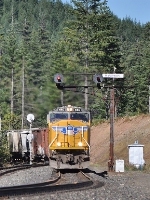 Title: UP 4160 brings an intermodel train north on the Hoxie sub. Description: The spring green of the trees and the yellow UP locomotives cast their reflection in the Columbia River. Description: Rochelle Railroad Park, approaching the diamonds with the BNSF, 0824 hours. Description: This UP duo is set to take an ailing yard switcher to Memphis. Description: This the what the shops for NS in Jacksonville consist of. The engines to the left are yard job locos and probably a unit from 251, the roadrailer. The UP SD70Ms are sitting on the Lake Track where they will be refueled and probably go out on 282 and 230. The track in the foreground is the Springfield Lead and taking it to the right leads to the Port of Jacksonville.